Not a fan of this photoshoot but it does not help when one is pressed for time. There will be a re-visit to re-do this shoot. 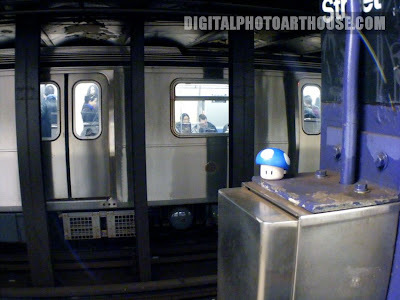 Traveling so much, The Traveling Mushroom loves to travel by train so this being underground and traveling in this method is home. This is a good start for now but we'll see in the future. A cross section of New York City's underground is an amazing and elaborate maze of wires, tubes, piping as well as a subway system. The sights, smells, people, efficiency and history are all so fascinating. The Subway system is mind blowing when you look at all the hard facts. The first tunnel was constructed in the late 1860's which makes it over 150 years old. They average 4 million riders every day on 468 different stations. Easy to use and you can get anywhere in the 5 boroughs fairly easy and quickly. If you don't know about the abandoned subway stations it is recommend you to google it. The best one if the old City Hall Station. It embodies the saying, "they don't make them like they use to". If you ask the Southbound 6 train conductor, you can stay on board as they do their loop through the station to go back North. It's not enough to get a photoshoot but WILL happen here!